This story has been updated with a new statement from Customs and Border Protection and a response from the ACLU. Documents obtained by NBC 7 Investigates show the U.S. government created a secret database of activists, journalists, and social media influencers tied to the migrant caravan and in some cases, placed alerts on their passports. At the end of 2018, roughly 5,000 immigrants from Central America made their way north through Mexico to the United States southern border. The story made international headlines. As the migrant caravan reached the San Ysidro Port of Entry in south San Diego County, so did journalists, attorneys, and advocates who were there to work and witness the events unfolding. But in the months that followed, journalists who covered the caravan, as well as those who offered assistance to caravan members, said they felt they had become targets of intense inspections and scrutiny by border officials. One photojournalist said she was pulled into secondary inspections three times and asked questions about who she saw and photographed in Tijuana shelters. Another photojournalist said she spent 13 hours detained by Mexican authorities when she tried to cross the border into Mexico City. Eventually, she was denied entry into Mexico and sent back to the U.S. These American photojournalists and attorneys said they suspected the U.S. government was monitoring them closely but until now, they couldn’t prove it. Now, documents leaked to NBC 7 Investigates show their fears weren’t baseless. In fact, their own government had listed their names in a secret database of targets, where agents collected information on them. Some had alerts placed on their passports, keeping at least two photojournalists and an attorney from entering Mexico to work. The documents were provided to NBC 7 by a Homeland Security source on the condition of anonymity, given the sensitive nature of what they were divulging. The source said the documents or screenshots show a SharePoint application that was used by agents from Customs and Border Protection (CBP) Immigration and Customs Enforcement (ICE), the U.S. Border Patrol, Homeland Security Investigations and some agents from the San Diego sector of the Federal Bureau of Investigations (FBI). The intelligence gathering efforts were done under the umbrella of “Operation Secure Line,” the operation designated to monitor the migrant caravan, according to the source. The documents list people who officials think should be targeted for screening at the border. The individuals listed include ten journalists, seven of whom are U.S. citizens, a U.S. attorney, and 48 people from the U.S. and other countries, labeled as organizers, instigators or their roles “unknown.” The target list includes advocates from organizations like Border Angels and Pueblo Sin Fronteras. To view the documents, click here or the link below. NBC 7 Investigates is blurring the names and photos of individuals who haven’t given us permission to publish their information. The documents are titled “San Diego Sector Foreign Operations Branch: Migrant Caravan FY-2019, Suspected Organizers, Coordinators, Instigators and Media” and are dated January 9, 2019. Emblazoned on it are the American and Mexican flags, with a banner that reads: "ILU-OASSIS-OMEGA." An official at the Department of Homeland Security said the seal indicates that the documents are a product of the International Liaison Unit (ILU), which coordinates intelligence between Mexico and the United States. This seal is emblazoned in the leaked documents to NBC 7 Investigates. For each person, the documents show their photo, often from their passport but in some cases from their social media accounts, along with their personal information. That information includes the person’s date of birth, their “country of commencement,” and their alleged role tied to the migrant caravan. The information also includes whether officials placed an alert on the person’s passport. Some individuals have a colored “X” over their photo, indicating whether they were arrested, interviewed, or had their visa or SENTRI pass revoked by officials. In addition to flagging the individuals for secondary screenings, the Homeland Security source told NBC 7 that the agents also created dossiers on each person listed. One dossier, shared with NBC 7, was on Nicole Ramos, the Refugee Director and attorney for Al Otro Lado, a law center for migrants and refugees in Tijuana, Mexico. The dossier included personal details on Ramos, including specific details about the car she drives, her mother’s name, and her work and travel history. After sharing the documents with Ramos, she said Al Otro Lado is seeking more information on why she and other attorneys at the law center have been targeted by border officials. “The document appears to prove what we have assumed for some time, which is that we are on a law enforcement list designed to retaliate against human rights defenders who work with asylum seekers and who are critical of CBP practices that violate the rights of asylum seekers,” Ramos told NBC 7 by email. In addition to the dossier on Ramos, a list of other dossier files created was shared with NBC 7. Two of the dossier files were labeled with the names of journalists but no further details were available. Those journalists were also listed as targets for secondary screenings. Customs and Border Protection has the authority to pull anyone into secondary screenings, but the documents show the agency is increasingly targeting journalists, attorneys, and immigration advocates. Former counterterrorism officials say the agency should not be targeting individuals based on their profession. NBC 7 Investigates sent the information to all border and law enforcement agencies the source listed, asking whether the information was valid and if these tactics were legal. A Customs and Border Protection spokesperson did not answer NBC 7’s list of questions or confirm the validity of the documents shared. To read CBP’s full statement, click here. Minutes after our story published and five days after a Customs and Border Protection spokesperson gave us the agency's statement above, CBP told our colleagues at NBC News that the names in the database are all people who were present during violence that broke out at the border in November. The agency also said journalists are being tracked so that the agency can learn more about what started that violence. CBP never clarified that point directly to NBC 7 Investigates. Staff attorney Esha Bhandari with the ACLU’s Speech, Privacy, and Technology Project, called the government's targeting of journalists and migrants "outrageous." “This is an outrageous violation of the First Amendment. The government cannot use the pretext of the border to target activists critical of its policies, lawyers providing legal representation, or journalists simply doing their jobs. We are exploring all options in response,” Bhandari said. Senior staff attorney Mitra Ebadolahi with the ACLU of San Diego’s Border Litigation Project called NBC 7's report the latest example of abuse of power by the CBP. “For years, the U.S. government has used the pretext of ‘border security' to trample on Americans’ constitutional rights. This most recent example is just the latest in a steady stream of CBP abuse of authority, and once again underscores the dire need for meaningful agency oversight and accountability," Ebadolahi said. NBC 7 Investigates spoke with seven of the journalists listed on the database as targets for secondary screenings, including freelance photojournalist Ariana Drehsler. “I'm interested in covering social and political issues,” Drehsler said, adding that she covered the migrant caravan in Tijuana for Buzzfeed News and United Press International. Drehsler estimated she had crossed the border from San Ysidro dozens of times covering the caravan. But on December 30, 2018, when Drehsler was crossing back into the United States, she was pulled into secondary inspection and questioned by border agents. After about an hour, Drehsler said she was allowed to leave but agents warned her that an alert had been placed on her passport and that she would be pulled into a secondary screening again if she crossed the border. The agents told her to plan accordingly, given the screenings could last an hour or more. When she asked why this alert was placed on her passport, agents told her they had no idea. Drehsler said she was pulled into secondary screenings two more times while crossing the border. Each time she said she was questioned by the same agents in plainclothes. The second time was on Jan. 2, 2019, and the third time was on Jan. 4, 2019. On the third occasion, Drehsler said she was told to leave her gear, including her camera and cell phone, on a table outside of the interview room. When she returned, she said it didn’t appear to her that the gear had been looked through. Agents asked Drehsler if she could show them the photos she had taken but she said she declined. Some of the questions agents asked Drehsler on the third screening struck her as odd. Drehsler told NBC 7 the personal details listed for her in the leaked screenshots are accurate. She confirmed the photo officials used came from her passport. 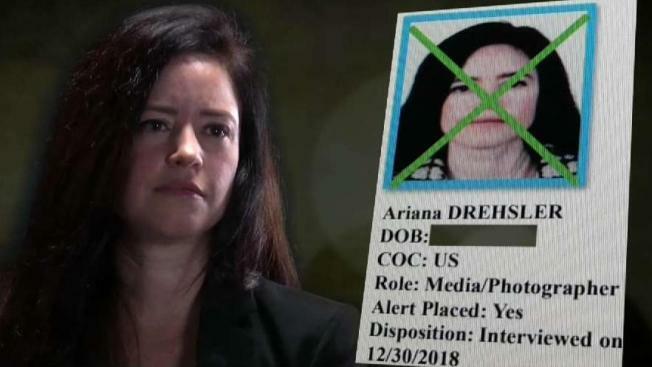 The screenshots include a green “X” over Drehsler’s photograph, indicating she had been interviewed by agents. Other journalists and attorneys have previously told news outlets like NPR and The Intercept that they too faced the same kind of increased scrutiny surrounding their work involving the migrant caravan. The journalists featured in the leaked documents said they were separated from their electronic devices and gear but had no evidence that agents had gone through their items. Kitra Cahana is another freelance photojournalist and U.S. citizen listed as a target in the documents. By phone from Honduras, Cahana told NBC 7 she also faced increased scrutiny and was eventually denied entry into Mexico for no apparent reason. Kitra Cahana is an award-winning freelance documentary photographer, videographer, a photo/video artist. Cahana's work has been featured in National Geographic magazine, The New York Times and the CBC out of Canada. One night in late December, she said Mexican authorities photographed her passport while she and other journalists were working near the border. Then, on Jan. 17, 2019, while traveling from Canada to Mexico City, Cahana said she had a connecting flight in Detroit, Michigan. Cahana said in Montreal, her passport was flagged while going through U.S. Customs pre-clearance. Cahana said she was pulled into a secondary screening where border agents asked her a list of questions about her work. Cahana said she was asked to explain how freelance photojournalism works, which she found strange. Afterward, her passport was flagged again in Detroit but eventually, she was allowed to board her flight and fly to Mexico City. But when she arrived in Mexico, her passport was flagged again. Cahana said she brought this to a Mexican official and was taken into a back room with another group of detained individuals. There, Cahana said her phone was taken away and she couldn’t leave the room. When she needed to use the restroom, an agent escorted her. Cahana said the whole ordeal lasted 13 hours and in the end, she was denied entry into Mexico. She had to wait until a plane arrived that could take her back to Detroit, where her flight originated. Since then, Cahana said she tried one more time to cross the border into Mexico. “I was trying to cross into Mexico through Guatemala to continue my work covering the caravan and then I was denied again,” Cahana said. NBC 7 Investigates confirmed another journalist was denied entry into Mexico after covering the caravan in January. That journalist is also listed in the SharePoint files leaked to NBC 7. In the documents shared with NBC 7, Cahana confirmed her personal details were accurate and that the photo used is from her passport. Cahana said she’s been in contact with the Committee to Protect Journalists and the ACLU as far as the alert placed on her passport, preventing her access to Mexico. Cahana said the increased scrutiny by border officials could have a chilling effect on freelance journalists covering the border. Correction: A previous version of this story stated three photojournalists were denied entry into Mexico. After speaking with those involved, it was clarified that only two photojournalists were denied entry into Mexico. The article above has been updated to reflect this. Want to know if you're on the target list? Have you faced increased scrutiny while covering a story at the border? NBC 7 Investigates wants to hear from you. Contact us at cbptargetlist@nbcuni.com.